After arriving in Jamaica in Dr No, and settling into his hotel, James Bond goes with his friend Quarrel for dinner at the Joy Boat restaurant. A glint of light caught the corner of Bond’s eye. He turned quickly. The Chinese girl from the airport was standing in the nearby shadows. Now she was dressed in a tight-fitting sheath of black satin slashed up one side almost to her hip. She had a Leica with a flash attachment in one hand. The other was in a leather case at her side. 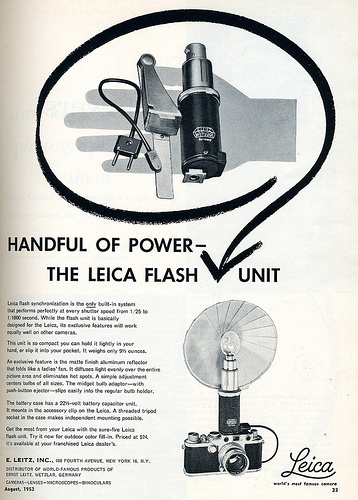 The hand came out holding a flashbulb. The girl slipped the base into her mouth to wet it and improve the contact and made to screw it into the reflector. This photographer was previously using the Speed Graphic Press Camera but has switched up to a smaller, more mobile camera for the restaurant. 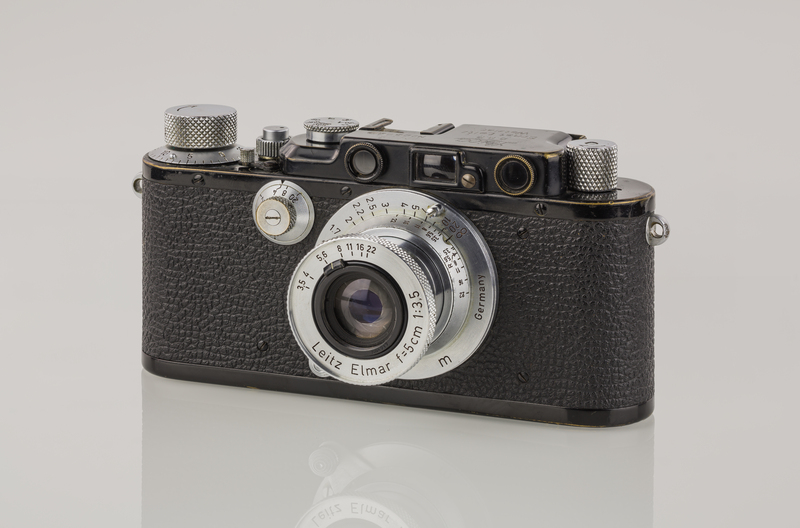 She was likely using either a Leica III or M3, two of the most popular Leica cameras during the 1950’s, along with a flash attachment. Or perhaps another brand such as Minox. In Goldfinger, Bond uses a Leica M3 when going to Auric Goldfinger’s suite to photograph Jill Masterton assisting her employer in cheating Mr Du Pont. Bond took the elevator up to his suite. 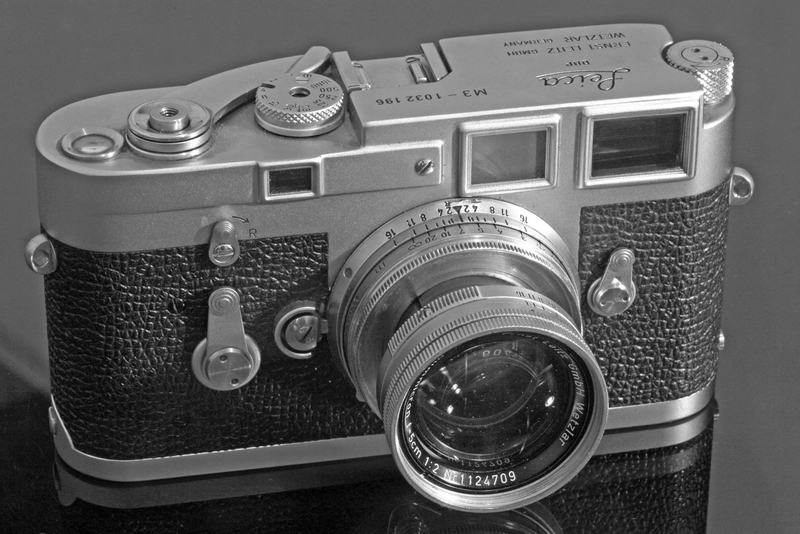 He went to his suitcase and extracted an M3 Leica, an MC exposure meter, a K2 filter and a flash-holder. He put a bulb in the holder and checked the camera. He went to his balcony, glanced at the sun to estimate where it would be at about three-thirty and went back into the sitting-room, leaving the door to the balcony open. He stood at the balcony door and aimed the exposure meter. The exposure was one-hundredth of a second. He set this on the Leica, put the shutter at f 11, and the distance at twelve feet. He clipped on a lens hood and took one picture to see that all was working. Then he wound on the film, slipped in the flash-holder and put the camera aside. He then startles her with the flash when photographing the scene. I don’t have my copy in front of me,but i think Bond also used a Leica to photograph Goldfinger’s suite -Jill Materson,binoculars short wave radio etc. Yes – absolutely correct. I’ve added that passage in above. Thanks!